There's no mistaking these year-round residents of Edmonton with their bold colouring. The feathers on the bird's tail (which are unusually long - at least half of their body length) and wings are black with iridescent metallic blue-green tones. Their bellies and shoulders are white. 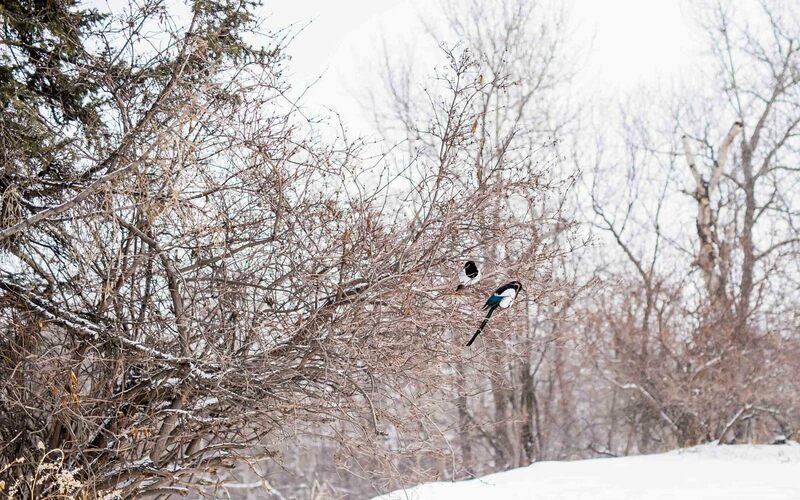 In fact, the December 2015 bird count, organized by Bird Studies Canada, found 2736 magpies in the city. That's the highest number that's ever been recorded. They've been around these parts for 3-4 million years. So they're definitely locals! They belong to the same extended family as ravens, crows and jays. The black-billed magpie is a social creature who is gregarious and forms loose flocks. Mating pairs stay together year-long. However, if a mate is lost, they get replaced quickly. These opportunistic, omnivorous creatures are resourceful. They scavenge and make the most of their surroundings, including what humans throwaway. Magpies will eat just about anything! They dine on 80%+ animal matter like insects, small mammals, other birds, hatchlings and eggs.